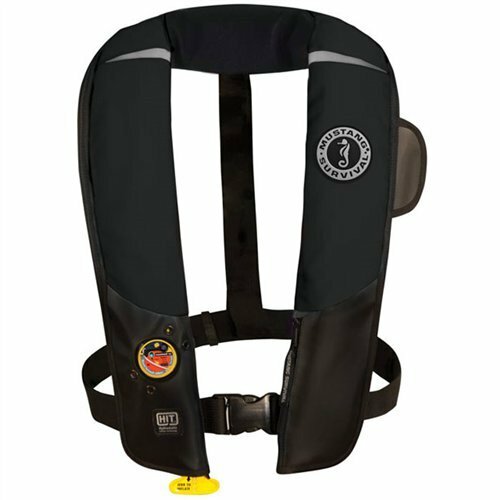 The award-winning HIT Inflatable PFD with Hydrostatic Inflator Technology is Mustang Survival's best-in-safety inflatable PFD. Designed for serious users with exclusive technology, it is designed for use in severe weather and requires minimal inflator maintenance. Features the exclusive USCG-approved Hydrostatic Inflator Technology, bright fluorescent yellow-green inflation cell, lightweight outer shell fabric used in the body armor industry, zippered pocket and a neoprene Comfort Collar. Research shows fluorescent yellow-green to be the most visible color in a water rescue scenario. For more information visit www.mustangsurvival.com/visibility. The award-winning HIT Inflatable PFD with Hydrostatic Inflator Technology is Mustang Survival's best-in-safety inflatable PFD. Designed for serious users with exclusive technology, it is designed for use in severe weather and requires minimal inflator maintenance. Features the exclusive USCG-approved Hydrostatic Inflator Technology, bright fluorescent yellow-green inflation cell, lightweight outer shell fabric used in the body armor industry, zippered pocket and a neoprene Comfort Collar. Research shows fluorescent yellow-green to be the most visible color in a water rescue scenario. For more information visit www.mustangsurvival.com/visibility.